Usually when a company purchases smartphones (or computers) for use by employees, there's a long setup process involved. Taking every phone out of the box, setting everything up, and installing management software can eat up a lot of time. Google is trying to solve this problem with 'zero-touch enrollment,' a way to make Android rollouts in the enterprise more seamless and secure. With this new feature, companies can configure the devices during the purchase process, so they are ready to go the moment they are shipped. You can see the entire setup process below - it's incredibly fast. Not only does it eliminate the need for the user (or IT people) to set everything up manually, but it ensures everyone has the same corporate policies in place. 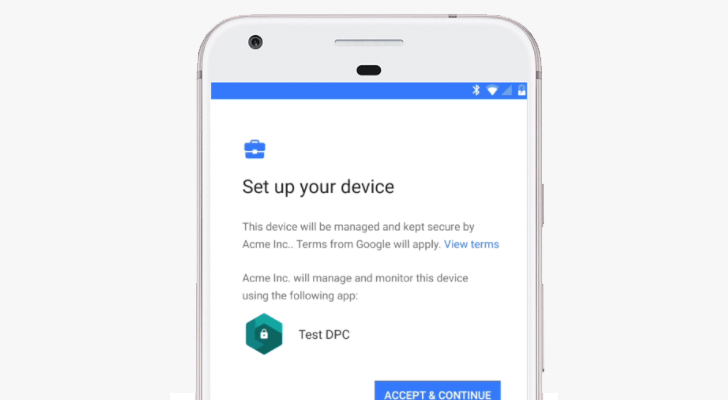 Organizations can use software from VMware AirWatch, BlackBerry, MobileIron, IBM, Gsuite, and others to pick configurations and device policies that are automatically applied. The feature will be available from devices purchased from Verizon, AT&T, Sprint, T-Mobile, BT, Deutsche Telekom, Softbank, and Telstra. For now, zero-touch only works on the Google Pixel, but Google is working with other OEMs (Sony, Samsung, LG, HMD Global, etc) to get this on more devices. The Sony Xperia XZ1/XZ1 Compact and Huawei Mate 10 will be among the first to support the feature. Google also said that any Samsung device that ships with, or is updated to, Android Oreo will support zero-touch.